Ishmael inspired art and graffiti: what is this site and why is it here? what is this site and why is it here? I have created this blog to promote the book Ishmael through my art and through an Ishmael sticker campaign. 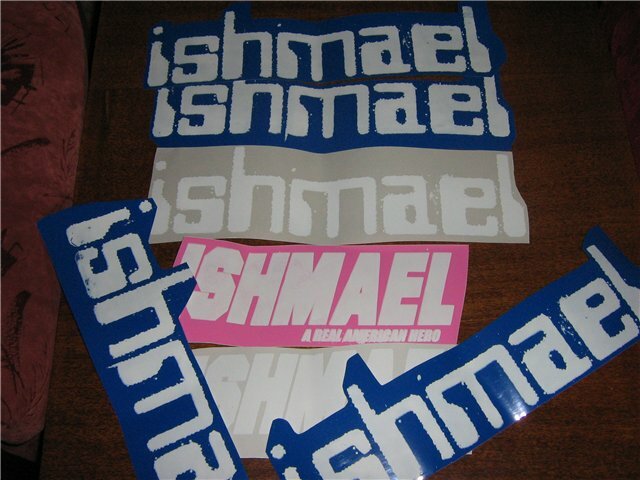 I have been making Ishmael stickers since 1999. The stickers have proven to increase the reading of Ishmael on a local level. The book Ishmael leaves us with a feeling of "what can I do" Well, start by slapping up a sticker. The stickers are 15 inches by 5 inches They are FREE. All i need is your mailing address. I have sent stickers to 21 different countries and growing. If your worried about address privacy,your address is deleted the second that I label your envelope. lá cây mật gấu có tác dụng chữa trị bệnh gì?lá cây mật gấu có tác dụng chữa trị bệnh gì?